We are currently searching for Chefs, who will work under the guidance of Head Chef – Nicolas Pasquier. The menus reflect the Roux trademark style of classically-constructed French dishes, blended with today’s tastes for lighter choice. 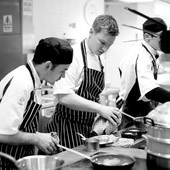 Roux at The Landau has very high standards and a fantastic team where you can learn and develop your skills.